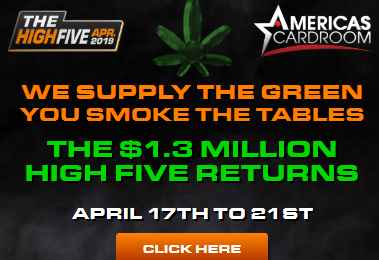 Americas Cardroom will start their 6th Online Super Series on the 5th anniversary of the Darkest Day in the History of Online Poker, Black Friday. That’s right, Friday, April 15th is the exact day back in 2011 that shocked the Worldwide Poker community when U.S. authorities opened sealed indictments, cracked down upon and shut out the big Three of Online Poker — Ultimate Bet (Cereus Network), Full Tilt and Poker Stars here in the USA……. A great deal has happened since that fateful day and Americas Cardroom has securely established themselves as the place for US players to play their favorite poker games online……. OSS VI will start on Friday April 15th. There will be 10 days of special events, at least 6 special OSS poker tournaments daily and total OSS prize pools will have total guarantees of $2.5 Million Dollars over the course of the 76 total event tournaments. As a matter of fact, for all of you micro players, there will be a total of 18 tournaments in the series with buy-ins of $5 or less all with guarantees of $500, $1K, $2K, $3K and up to $5K. The most common Buy-in during OSS VI will be the $10+1 buy-in tournaments (11 total $11 events), all with Guarantees of $3K to $5K. Top level events will have buy-ins of $25 or more (25 total) and will range up to a $540 buy-in for the Million Dollar GTD on Main Event Sunday. Top level events include: OSS VI # 5 $35K GTD, Event #13 $50K GTD, Event #16 $75K GTD, Event #33 $60K GTD, Event #41 $50K GTD, Event #68 $40K GTD, Event # 69 $200K GTD, Event #70 $1 Million Dollars GTD and Event #73 $50K GTD. Tournament Start Times will be as early as 2PM ET on most days, with the majority of events having 5PM, 6PM and 7PM ET and later start times for the larger guaranteed tournaments….. Tournament Formats will include: NLHE, PLO, PLO/8, Bounties, Turbos, Re-buys, Ante-up, 6 Max, 4 Max, LHE, Mega Stacks and various combinations of each format. Satellites for the larger guaranteed events are running now on ACR and will escalate in frequency (especially for the $1 Million Dollar Event) as we get closer to the April 15th start. Look for the 50 and 100 Seat Super Satellites to the Million Dollar Sunday tournament on Friday, April 22nd at 7:30 PM ET, Saturday, April 23rd at 7:30PM ET and Sunday, April 24th at 11:30AM ET. Sunday April 24th have have the most Tournaments for the OSS VI, 10 total…..
Americas Cradroom is planning for this to be the Best Super Series yet, I would expect them to offer a Re-load bonus for existing players (they always do) before and during the Super Series.